Despite the difficulties involved and an official ban, an increasing number of European people who cannot have children on their own are turning to various surrogacy and egg donation arrangements abroad. Ethical Surrogacy Practices seminars provide answers to ethical concerns many have. There are many different ways to structure surrogacy arrangements, and prospective parents have control on many aspects of the journey. The purpose of the seminars and online resources here is to help inform future parents and so they can make personal ethical decisions about each step. Rather than provide one set of rules, the seminars explore ways to address specific issues, and provide advice on how to make each journey more in line with the ethical standards of the parents. This site contains seminar announcements as well as video clips of past seminars, and relevant articles, news and links. At the request of Swedish couples that are in the process of becoming parents, two leading experts have agreed to come to Stockholm on May 2, 2012, along with a four-time surrogate mother from Minnesota, and a two-time egg donor form Connecticut. 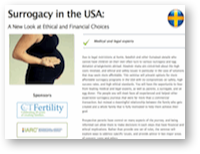 The seminar is offered in cooperation with FSS (Föreningen för surrogatmödraskap), the Swedish association working to spread information about Surrogacy (Surrogat.nu). The event will commence at 18:30 with an hour long reception that will include several Swedish surrogacy families as well as prospective parents and the guests from the USA. The presentation and discussion will being at 19:30 and expect to last until 21:00. 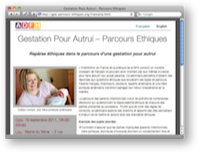 The French association ADFH presented the "Gestation Pour Autrui – Parcours Ethiques" seminar in Paris on September 19, 2011. The well attended seminar featured several experts from the USA and France, as well as a surrogate and two parents. The focus was the practices that can allow people adjust their surrogacy journey to suite their ethical convictions. Click on the image on the left for the seminar page, or you see the entire program in our video library (English and French).